KidSmart, currently based out of Hazelwood, is the only free educational supply store in Missouri and it was started back in 2002 by Jennifer Miller. Jill Laux, Director of Charitable Giving for the organization states that it is operated by five employees with the help of a host of volunteers and sponsors. Laux shared that since 2002, Miller has been able to provide over $57 million dollars-worth of free school supplies in the St. Louis area. Volunteers come to KidSmart’s warehouse to help in various ways not limited to unloading, packing and stocking school supplies. This school delivery program that KidSmart began last year, On the Go!, is one of their eight programs and partnerships. It is a partnership with Kids Vision for Life and Americorps VISTA. The program’s truck takes its services on the road to classrooms. A day is coordinated with each school KidSmart sponsors for the weekly program. Crafts with Conviction, another of KidSmart’s programs, utilizes over 1,000 offenders in Missouri correctional facilities every year who donate over 500,000 hours of their time to create educational and learning materials. Laux shared that any school that is 70 percent free with a reduced lunch, is state certified, and has a self-contained classroom teacher, is eligible for KidSmart. The organization currently provides school supplies to 161 schools in the St. Louis area. The goal is to expand regionally. “We have found that the need is great in a lot of rural areas and across the state in general,” stated Laux. Though KidSmart’s current exact location is undisclosed to the general public, the organization is working on buying a building that will have a giant warehouse at which teachers can “shop” free for their students. A big capital campaign is underway to raise money for the building initiative. One of the biggest ways that KidSmart is financially supported, enabling them to provide school supplies for kids, is through Joe Buck’s annual back-to-school celebrity event. Plans are currently underway for the annual event. KidSmart may be contacted at info@kidsmartstl.org or by phone at 314-291-6211. Donations or volunteer sign-up is also available on their website: https://kidsmartstl.org/volunteer. 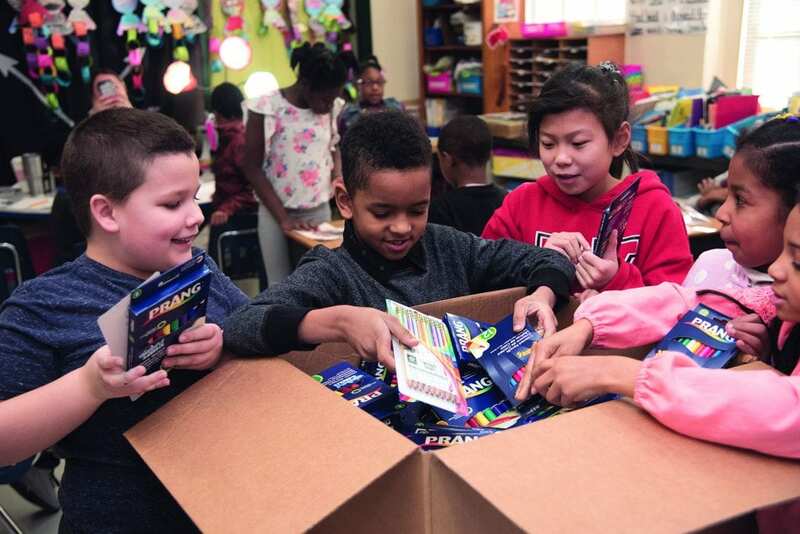 CUTLINE: Submitted photos Since 2002, KidSmart has been able to provide over $57 million dollars-worth of free school supplies in the St. Louis area.